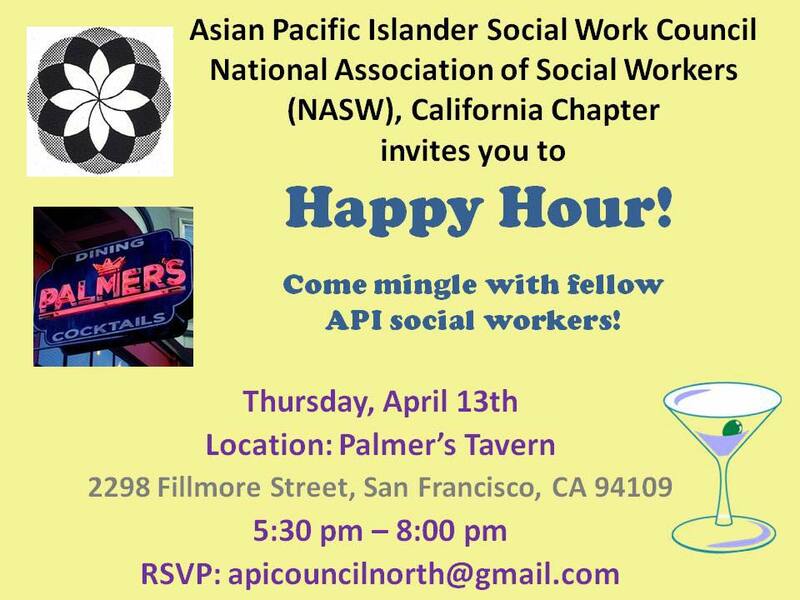 Welcome to API Social Work Council-Northern CA Chapter-NASW! ​The API Social Work Council is proud to announce the availability of the 2019 Diana Ming Chan Bilingual Social Work Scholarship. Congratulations to the 2017 Diana Ming Chan Bilingual Social Work Scholarship Recipients! Congratulations to the 3 recipients of the 2017 Diana Ming Chan Bilingual Social Work Scholarship: Ricky Lau from San Jose State University; Iris Z Lin from UC Berkeley; and Melody Sit from UC Berkeley. API Social Work Council Co-chair, Janice Jiewen Huang, introduced them at the NASW-CA Awards Luncheon on October 20th where each of them were recognized. Diana Ming Chan’s husband, Clarence, and their 3 children also attended the Awards Luncheon. Subscribe to our listserve for job postings, events, etc. 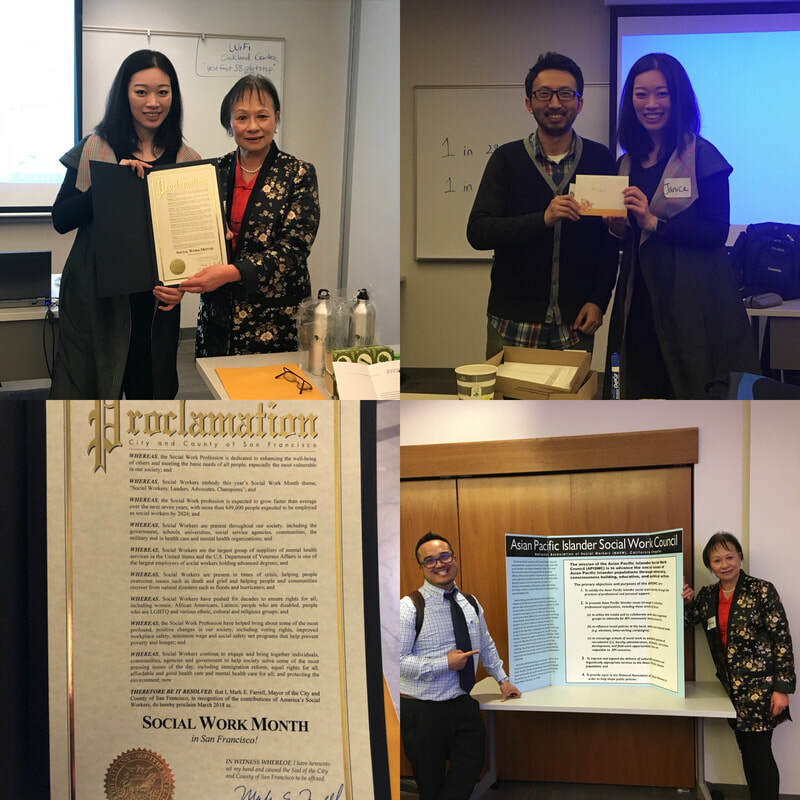 ​The APISWC and the SF Bay Area Chinese Community Depression Education Project hosted a CEU workshop on Saturday, April 21, 2018, at the CSU East Bay Oakland Professional Development and Conference Center, from 1:00 to 3:30 PM. Dr. Rose Wong, Chair of the Department of Social Work at CSU East Bay, and Nancy Lim-Yee, LCSW shared the results of their recent project to develop a series of short videos for training healthcare providers to assess depression and suicidal risk among their Chinese patients. They discussed the development and relevance of their project, shared some statistics about depression in the Asian community, and then screened the videos. 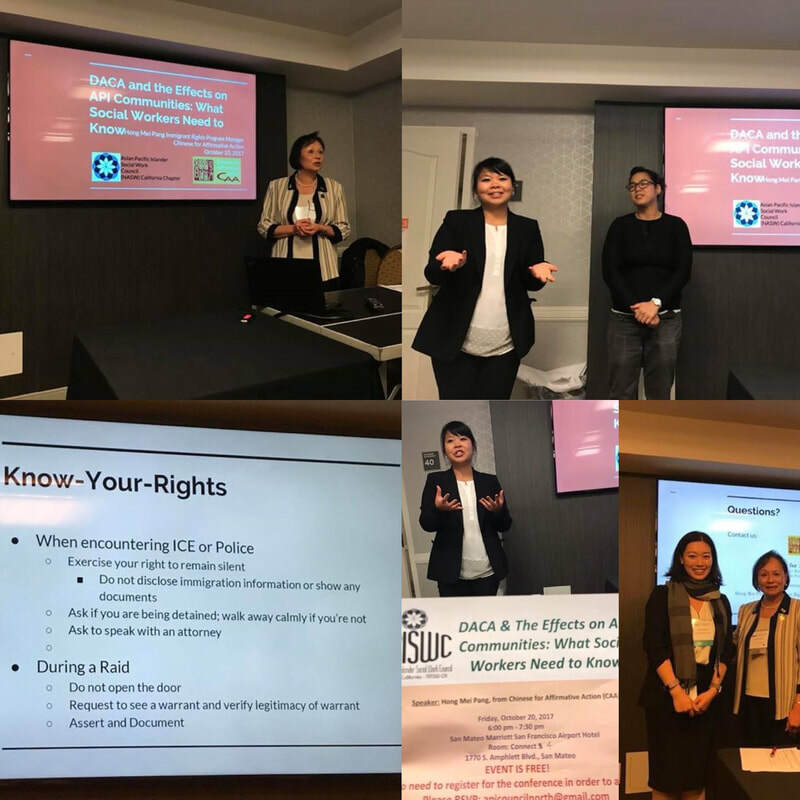 Thanks to those of you who were able to join us this past Friday evening at the Marriott San Mateo SFO Airport Hotel for a very interesting presentation by staff from Chinese for Affirmative Action on "DACA and the Effects on API Communities: What Social Workers Need to Know". The presenters, Hong Mei Pang and Annette Wong, brought a great deal of resources to share. The Council is very grateful to them for sharing their time and expertise with us. Please go to Chinese for Affirmative Action's website www.caasf.org for more information about the services they provide. The San Francisco Immigrant Legal and Education Network (www.sfilen.org) also provides some great resources. Please check them out when you have a chance. 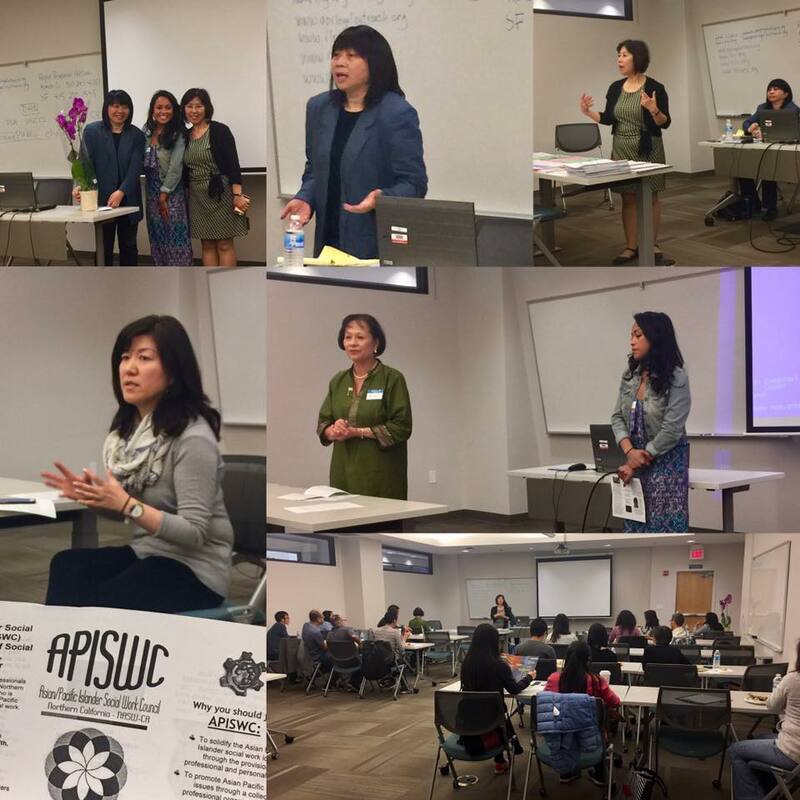 On May 6, 2017, The API Social Work Council invited immigration attorney, Nancy Hing Wong, from Asian Pacific Islander Legal Outreach to speak on the "Legal and Social Impacts of the Immigration Ban." Ms. Wong gave a very informative presentation as well as made available a number of useful resources. 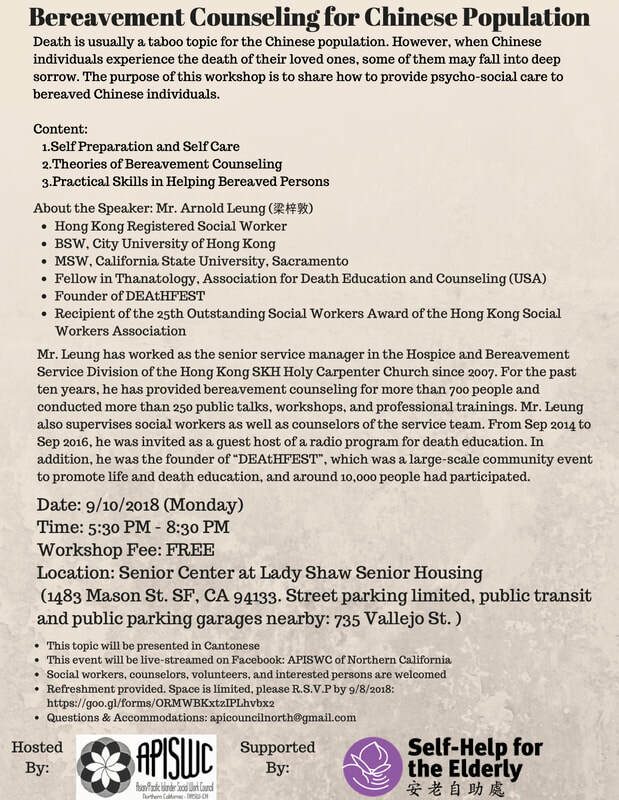 Council co-chair, Richell Jose, and co-founding member, Nancy Lim-Yee, presented information about the API Social Work Council during the meeting. Our Council member, Jenny Kwak, talked briefly about her article "Standing Up", which recently appeared in NASW-CA News. There is an ever-growing body of research to suggest all addictions – substance-based or otherwise, have shared causal pathways, and therefore have commonalities in disease maintenance, treatment, and recovery. This workshop will present current neurological research on the process of addiction, and provide practical interventions for promoting brain healing and recovery. For the past 9 years, Michael S. Liao, MSW has been providing problem gambling training and technical assistance to various groups throughout the state of California. He has also authored various problem gambling training curricula and academic publications. Light lunch provided & 2 CEUs for LCSW/LMFT! *Free* for members or $10 at the door. $10 annual membership pays for itself! API Social Worker Council: 20th Year Anniversary Celebration!! It's time to celebrate! 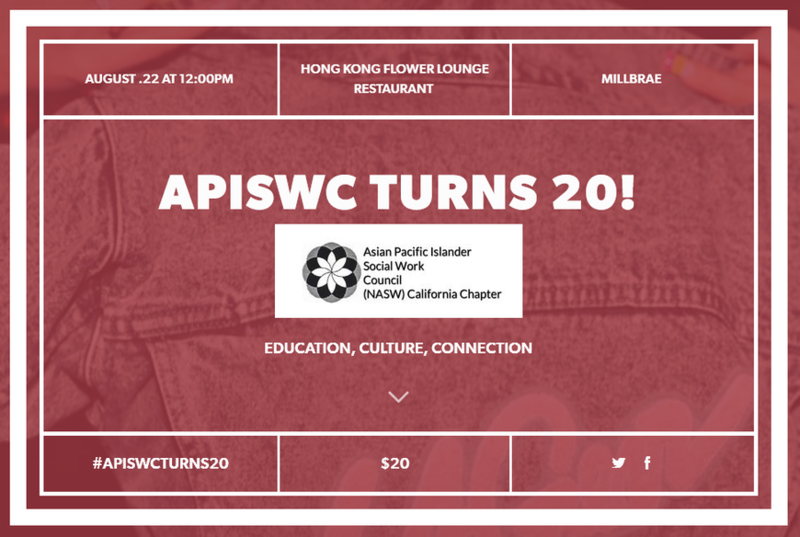 APISWC is turning 20! Let's come together on August 22nd to share a meal, reflect together on our accomplishments, reunite with familiar faces, and look forward to the next 20 years!